Is it possible to make the best car audio amplifier worldwide even better? This was really a challenge for our engineers when they started the development of the MX4 PRO. When designing a BRAX product it is essential to reconsider and optimize every single detail again and again, even if it seems to be less significant at first sight. From our understanding this is the one and only approach how to shift the limits – acoustically and technically – further and further. Finally we are absolutely convinced that the MX4 PRO redefines the benchmark for amplifiers once again. This masterpiece is the perfect symbiosis of state-of-the-art components and ingenious technological improvements without neglecting the heritage and the tradition of the brand that BRAX is famous for. As the only manufacturer we still take it for granted to manually select power transistors for the production of each BRAX amplifier – and it is no secret that the necessary instruments and tools for this selection procedure are in-house developments. This one-of-a-kind process not only assures lowest possible serial tolerances but as well unrivalled measurement and power data. A significant proportion for the overall performance is based on the extensive effort that is made for the power supply of all modules inside our amplifiers. Separate and stabilized supply voltages for each two channels warrant perfect conditions for every amplifier stage. The ultra-low ESR electrolytic capacitors (specially made for Audiotec Fischer) are meanwhile as legendary as our encapsulated toroid power transformers that come up with more than 1,800 watts power supply output just like that. A completely revised PCB design with four massive copper layers in total assures maximum current flow – so it is no wonder that the MX4 PRO with its mere 4 x 300 RMS into 4/2/1 Ohms delivers more power to the speaker terminals than ever before. But that's not enough – the MX4 PRO is as well a paradigm for bridging the gap between traditional amplifier technology and the digital era. We have made an unparalleled effort just for the volume control of the digital inputs. As a novelty in the car audio segment the volume adjustment in combination with the BRAX DSP takes place just before the output stages that drive the speakers - needless to say that this happens in the analog domain without sacrificing any signal resolution. The BRAX DSP embeds the volume information in the digital SPDIF data stream which then is decoded inside the MX4 PRO. This aspect alone proves the striving of our engineers for pure perfection – and please rest assured that this meticulousness is set to continue throughout the entire production process. Each single amplifier is custom-made on demand and its respective serial number is recorded in our data-base. Therefore every BRAX MX4 PRO is a precious unique product that rightly deserves the title “high-end made in Germany”. In a car audio system there are typically two possibilities to control the playback volume. This is the predominant method, but it has a disadvantage as soon as there is an additional digital signal processor in the audio path. The full resolution of the DSP can only be exploited when the volume of the source is set to full-scale output. Otherwise audio bits get “lost” so that at very low volume levels the sound lacks of precision. But this loss can also happen if no DSP is in the signal path between head unit and amplifier as most of the radios today incorporate a digital volume control which also has a negative effect on the signal resolution at low volume levels. In this case the signal source delivers a full-scale signal so that a DSP in the signal path can operate under best possible conditions without truncating any bits, e.g. during AD conversion process. A remote control connected to the DSP will then be responsible for adjusting the volume inside the signal processor in the digital domain, but this also has a slight impact on sound quality. The MX4 PRO in combination with the BRAX DSP follows a different, yet the most consequent and extensive approach in order to avoid any degradation of sound quality. Audiotec Fischers exclusive and proprietary “DiSAC” technology operates perfectly if either the audio source does not incorporate any volume adjustment or the source always delivers a high signal level. In that case the audio processing inside the BRAX DSP is done without reducing the audio resolution at any time. For adjusting the playback volume either the cable remote URC.3 or the display remote DIRECTOR can be chosen. The speciality lies in the fact that the volume information from the remote will be encoded inside the BRAX DSP and embedded into the digital audio data stream of the SPDIF outputs and thus transferred to the MX4 PRO. The MX4 PRO itself is able to extract and decode the volume information from the digital data stream, using this to adjust the lossless analog volume controllers (PGA’s) after the DA converters. 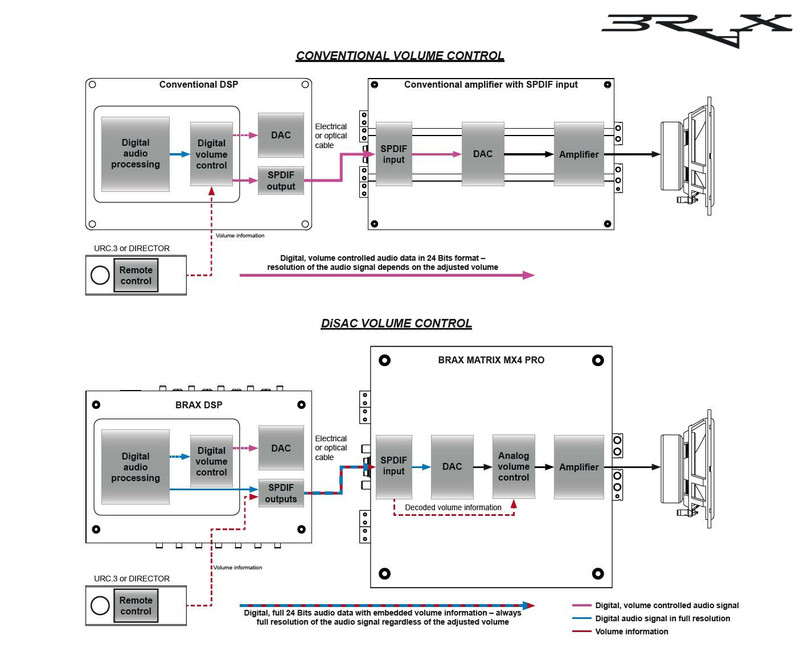 This simply means that the volume control takes place in the signal path where it does not have any negative impact on sound quality, actually just before the output stages that drive the loudspeakers. This type of volume control is truly an uniqueness in the car audio segment and proofs once again that Audiotec Fischer didn’t spare any effort to redefine the pinnacle of sound quality once again. The switched power supply of the BRAX MX4 PRO assures operation even if the battery’s voltage drops down to 6 Volts during engine crank. 3.11 x 14.17 x 14.17"